Molar incisor hypomineralisation associated with caries? Yesterday we considered a review of the aetiological factors associated with molar incisor hypomineralisation (MIH). There are concerns that the prevalence of MIH may be increasing and a number of studies have suggested that children with MIH are more likely to have dental caries. The aim of this review is to assess the association between MIH and dental caries in the permanent dentition. None of the included studies was considered to be of high quality. The studies were conducted in a number of countries, Bosnia and Herzegovina, Brazil, China, Germany, Greece, India, Iran, Iraq, New Zealand, Slovenia, Spain, Sweden and Thailand. Prevalence of MIH in the included studies ranged for 2.8%- 36.5%. 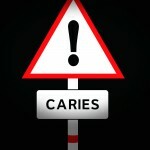 Most publications reported that children with MIH have higher caries experience. One study did not observe a difference in DMF values among children affected or not by MIH. Three studies reported that children with MIH were 2.1 to 4.6 times more likely to have caries in the permanent dentition than children without MIH. The findings show a significant association between MIH and dental caries. Both DMF index and caries prevalence were higher in children with MIH than in children without MIH. As none of the studies included in the present review was, however, classified as high-quality studies, the results should be interpreted cautiously. This review is restricted to a single database and English language studies so it is possible that relevant studies have not been included. The possibility for observer bias exists in the majority of the included studies as caries and DMF was assessed by the same observer, only in 3 studies were separate observers used. As the authors note the DMF index is insensitive which may result in an overestimation of caries levels in those affected by MIH. Americano GC, Jacobsen PE, Soviero VM, Haubek D. A systematic review on the association between molar incisor hypomineralization and dental caries. Int J Paediatr Dent. 2016 Apr 21. doi: 10.1111/ipd.12233. [Epub ahead of print] Review. PubMed PMID: 27098755.